Logs Of 911 Calls Reveal The Troubled History Of Florida School Shooter : The Two-Way Records show that Broward County had received multiple calls since 2008 about the volatile behavior of the young man arrested in the Parkland, Fla., high school shooting. 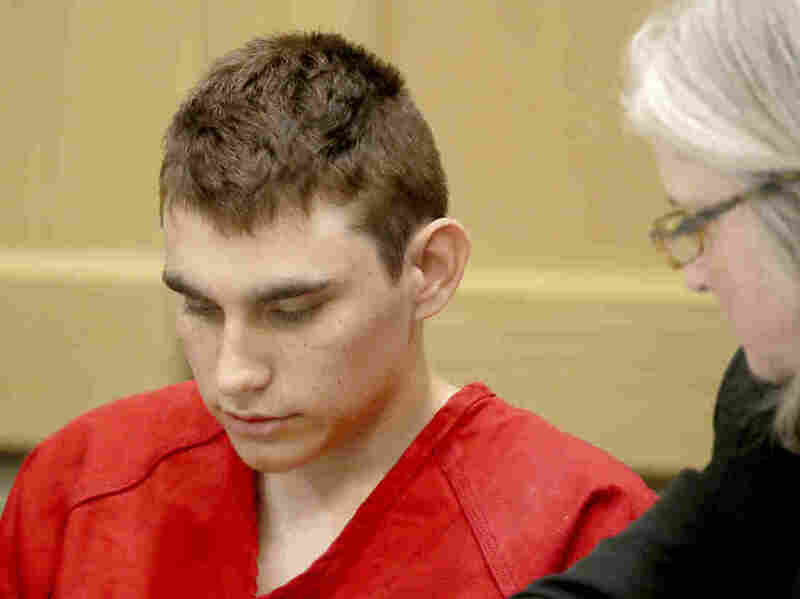 Nikolas Cruz appears in court for a status hearing in Fort Lauderdale, Florida. Newly released tapes and logs of 911 calls show that police had responded to at least two dozen incidents of violent or disruptive behavior over 10 years by the 19-year-old suspect in the fatal shootings of 17 students and staff at a Marjory Stoneman Douglas High School in Parkland, Fla., last week. On November 29 of last year, Nikolas Cruz called 911 himself in Palm Beach County to report that someone "attacked me and said they were going to gut me." In a 5 ½-minute call, Cruz says, "I kind of got mad and I started punching walls and stuff and then a kid came at me and threw me on the ground, and he started attacking me and kicked me out of the house." In another call, a woman, whose name was redacted, describes an altercation between her adult son and Cruz. She also said she's worried that Cruz is going to get a gun, "because that's all he wants is his gun, and that's all he cares about is his gun." The Miami Herald and other news organizations identify the caller as 42-year-old Roxanne Deschamps, who had taken in Cruz and his younger brother, Zachary, after their mother died earlier that month. Those two calls are just part of the story authorities are piecing together about the troubled history of the alleged shooter and how various government agencies and school officials failed to effectively intervene before the shooting last week. Meanwhile, the Broward Sheriff's office released records dating back 10 years documenting contacts it had with Nikolas Cruz, the 19-year-old suspect. The records released are logs of 23 separate 911 calls, including 15 calls made by his now-deceased mother, Linda Cruz, reporting disputes and disturbances involving Cruz between November 2008 and June 2014. Several other calls were made by third parties beginning in February 2016 through November 2017. The Sheriff's Office's response to two of the calls is under investigation by its Internal Affairs unit. "Third hand information from the neighbor's son that Nikolas Cruz planned to shoot up the school on Instagram (Picture of Juvenile with guns.) One month time delay. Unknown high school. Cruz lives in area." The log says that the deputy made contact with the anonymous caller. Upon learning that Cruz possessed knives and a BB gun, that information was "forwarded to Stoneman Douglas School Resource Officer." "Caller advised subject Nikolas Cruz is collecting guns and knives. Cruz wants to join the Army. Concerned he will kill himself one day and believes he could be a school shooter in the making. Caller advised Cruz was no longer living at the listed parkland address and is now living Lake Worth, FL. Believes the weapons are kept at a friend's house at an unknown location." The log says that the deputy contacted the caller located in Massachusetts via telephone. "No report was initiated...Deputy advised her referred the caller to the Palm Beach Sheriff's Office." On Thursday, Sheriff Scott Israel announced that two of his deputies are on restrictive duty pending an investigation into whether they followed policy in responding to 911 calls about the alleged shooter.